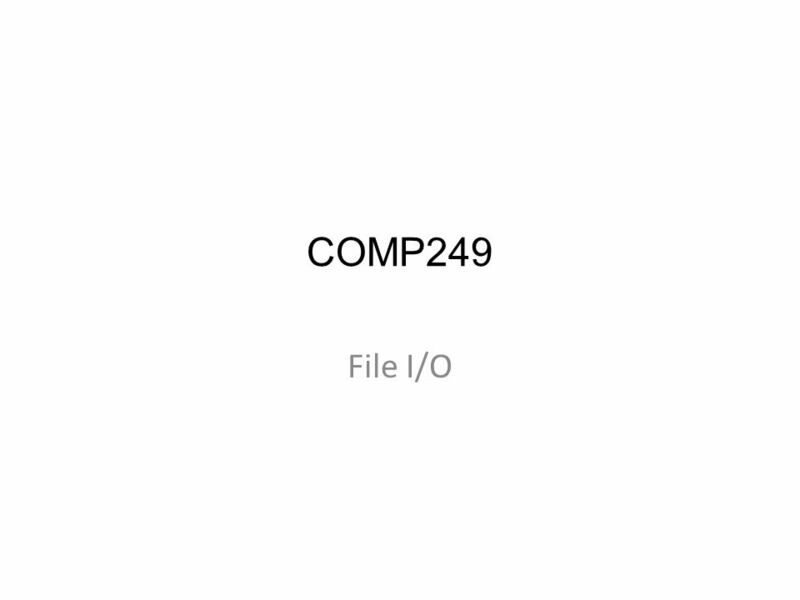 Download ppt "COMP249 File I/O." 1 Streams and Input/Output Files Part 2. 2 Files and Exceptions When creating files and performing I/O operations on them, the systems generates errors. 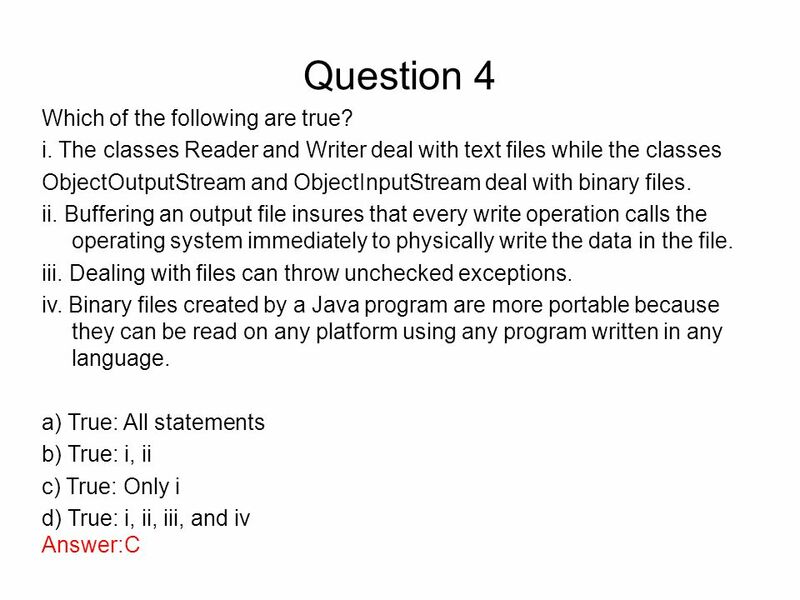 Chapter 10 Ch 1 – Introduction to Computers and Java Streams and File IO 1. 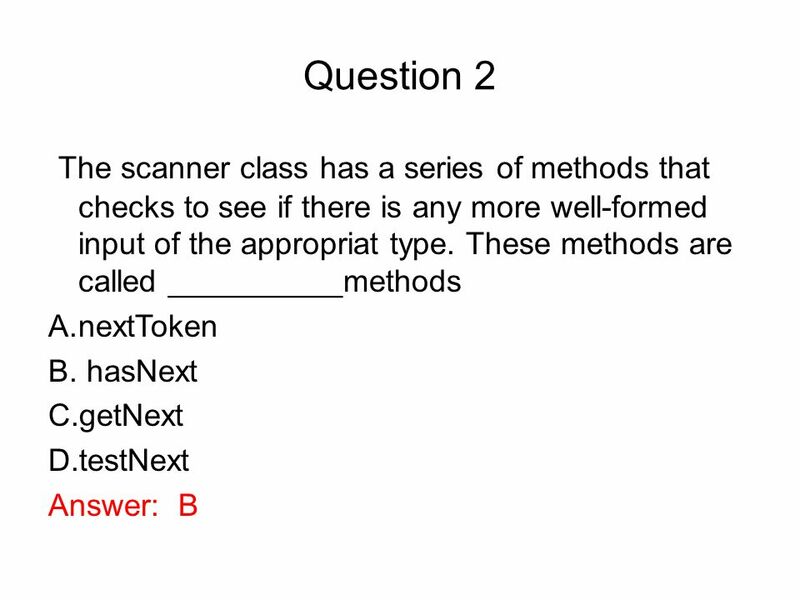 Exception Handling. Background In a perfect world, users would never enter data in the wrong form, files they choose to open would always exist, and code. 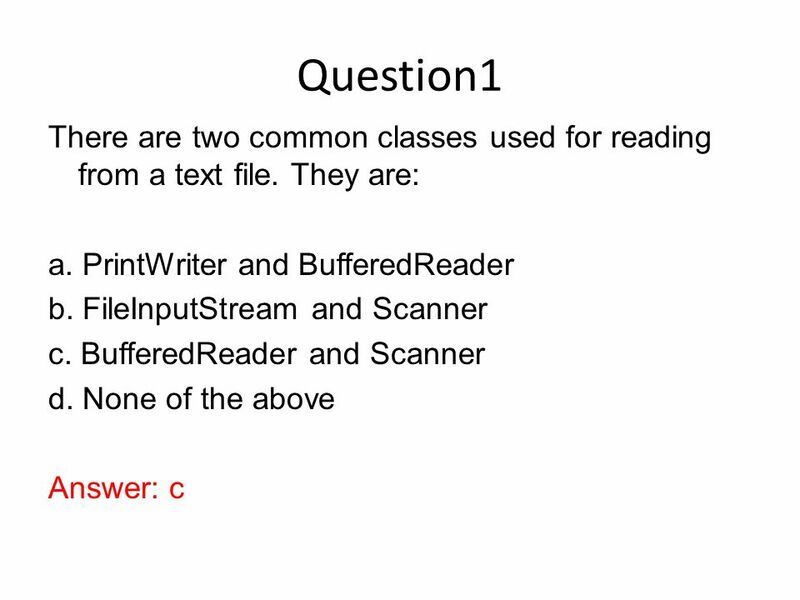 COMP201 Java Programming Topic 5: Input and Output Reading: Chapter 12. 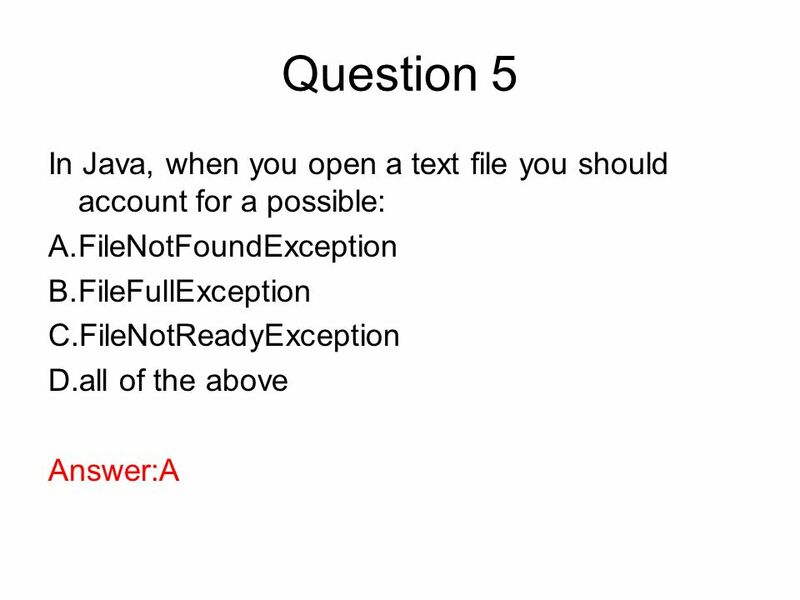 10-1 Writing to a Text File When a text file is opened in this way, a FileNotFoundException can be thrown – In this context it actually means that the. Text File I/O. Text Files and Binary Files Files that are designed to be read by human beings, and that can be read or written with an editor are called. CS 206 Introduction to Computer Science II 09 / 14 / 2009 Instructor: Michael Eckmann. Simple Java I/O Part I General Principles. 2 Streams All modern I/O is stream-based A stream is a connection to a source of data or to a destination for. Chapter 91 Streams and File I/O Chapter 9. 2 Announcements Project 5 due last night Project 6 assigned Exam 2 –Wed., March 21, 7:00 – 8:00 pm, LILY 1105. CS 206 Introduction to Computer Science II 09 / 04 / 2008 Instructor: Michael Eckmann. Slides prepared by Rose Williams, Binghamton University Chapter 10 File I/O. 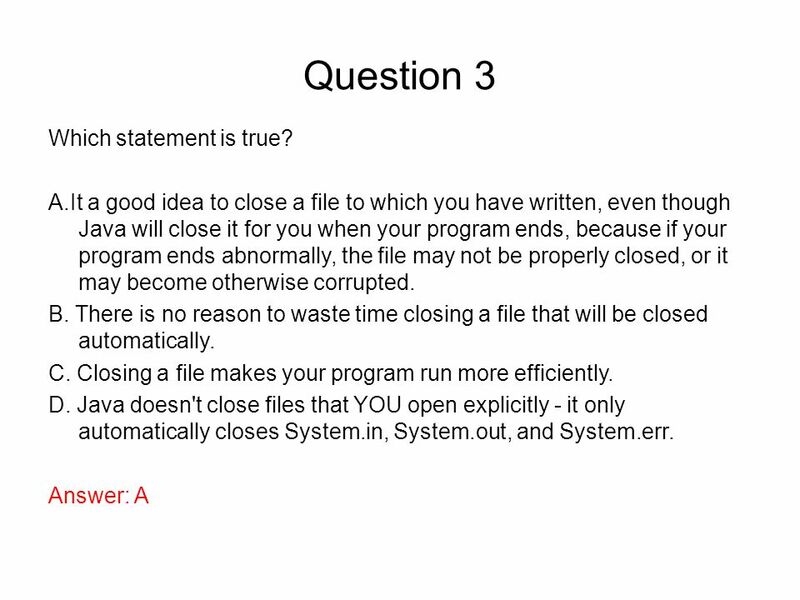 Lecture 30 Streams and File I/O COMP1681 / SE15 Introduction to Programming.